The market of wearable devices has been growing for several years, but so-called "smart bracelets" due to their relative availability have so far demonstrated a higher sales dynamics. Nevertheless, according to IDC experts, in the second quarter of this year, the smart bracelet market fell by 0.9% for the first time in history, while sales of smart watches grew by 60.9% year-on-year. Even according to the dynamics of growth in Apple Watch sales, it is noticeable that the clock is gaining popularity, although they are more expensive than bracelets. 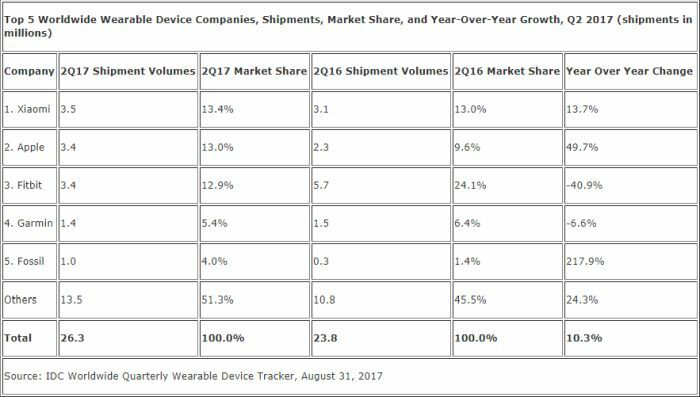 The Cupertino company, according to IDC, ranks second in the wearable device market with a 13% share, and Xiaomi remains the leader. By the way, this brand also produces smart shoes, so the range of offers is gradually expanding. Apple Watch with the advent of new generation devices this month will also certainly strengthen their market position. Interestingly, in the second quarter of this year, 41.7% of wearable devices offered work with GPS, while a year ago this share did not exceed 24.5%. Many users can no longer be satisfied with devices with a basic set of capabilities, and prefer to overpay for the expansion of functional qualities.